All to often I hear people tossing about performance specs they’ve read off peripheral packaging, as if it were gospel. In particular, in my professional role dealing with media creation, I continually run into people claiming USB 2.0 is “faster” because the marketing-speak from Intel claims theoretical throughput greater than that of Firewire. Well, tune in and I’ll demonstrate why that just isn’t true and why Firewire is the choice of professional video editors. Contrary to widely held beliefs, propped up by the theoretical numbers marketers like to bandy about, USB 2.0 is far inferior in terms of the kind of performance required for external disk storage, not just for digital video use, but for general use as well. 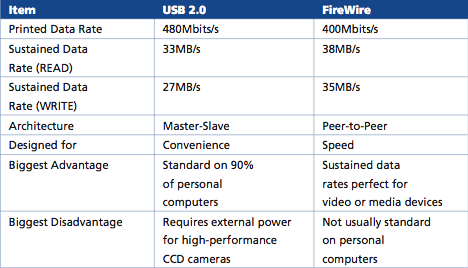 While marketers like to tout USB 2.0 throughput as 480 Mbps versus FireWire’s 400 Mbps, what they don’t discuss is the built-in inefficiency of the USB 2.0 architecture, which substantially reduces actual sustained throughput (the kind you want for disk storage and video editing). Technically speaking, Firewire uses an architecture in which the peripherals negotiate bus conflicts to determine which device can best control data transfer. This peer-to-peer arrangement works well because the devices are independently intelligent. USB 2.0, on the other hand, uses a master-slave architecture, wherein the host computer handles all arbitration functions and dictates data flow between the attached peripherals (adding additional system overhead and resulting in slower data flow control). It is this flow-control that is a critical determinant in the actual performance of the device. A great example, presented by PC Magazine, reveals USB 2.0 is not 40 times faster than USB 1.1 (as promised by comparing the “rated” throughput), but merely 2 to 13 times as fast1. Not only is that a wide discrepancy in the rated throughput, but also in actual performance. This is due, fundamentally, to the flow-control architecture. As you can see, the performance gap substantially widens as you move from large numbers of small files to small numbers of large files. Because video editing generally consists of utilizing large files, you can see why Firewire 400 is the substantially better interface. Then, consider Firewire 800 and you should be sold on the choice of Firewire for video editing.